Although his work has been badly damaged over the years, the work that has survived shows an artist as experimentalist with his colours in frescos and oil. One such experiment was using a mixture of egg yolk and liquid varnish to finish his frescos. He claimed this method to be an effective way to preserve the pieces, but as the works wore away the method was later debunked. 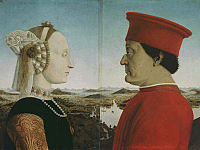 In 1448, Baldovinetti became a member of the Accademia di San Luca (Academy of Saint Luke) in Rome. It was during this time (1441-1451), though no official record exists, that he assisted with decorations in the Church of S. Egidio in Rome, with the artists Domenico Veneziano and Andrea del Castagno. His other collaboration with Veneziano and Castagno were the Frescos in the Santa Maria Nuova in Florence. 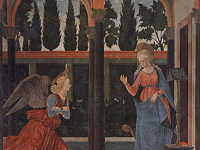 These frescos have since been destroyed, but his work of a major fresco in the cloister of the Annunziata basilica in Florence, titled the Annunciation is still in tact. His other surviving works include those done for the chapel decorations in the basilica di San Miniato al Monte (Basilica of St. Minias on the Mountain) in Florence. Among the frescos painted for the chapel are that of Angels, prophets and the Evangelists and four fathers of the Church. Another of his pieces, titled Annunciation was also done for the chapel. 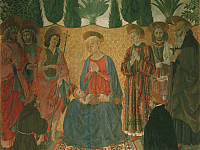 Baldovinetti worked on several pieces for the Santa Trinita Church, (Holy Trinity) from 1471 and completing them in 1497. He painted an altar piece of the Virgin Mary and child with the saints Gualberto and Benedetto, which is now in the Academy of Florence. There is also a series of frescos based on the Old Testament and portraits of some of Florence’s prominent citizens, greatly valued at the time. During this period, Baldovinetti also explored his craftsmanship in mosaic work; gaining a reputation as one of the best mosaic workers of the day. He returned to the San Miniato to repair the mosaics of the church’s doors and around the baptistery and cathedral. Two of his works are in the Uffizi Gallery, including the Annunciation and Madonna and Child with Saints.